Boden’s cute Classic Shirt ($60 + 20% off) and Windsor Wide-Leg Jeans ($98 + 20% off). Over the last year or two, Boden has been growing on me big-time. This brand, one of the few that features tailored and sophisticated outfits that aren’t boring has always had cute colors and cuts. Lately they’ve been taking steps to modernize their patterns with smaller prints and update their staid items for a more classic yet modern feel. I am beyond delighted with their September catalogue (full eye candy post later today!) and wanted to show how easy it is to make outfits with their cute goodies. Inside, I’ve got 10 looks put together that can worn for the workday or everyday in our lives! First let’s take a look at a couple more of my favorites from the catalogue. The Edwina Ottoman Dress ($98 + 20% off) comes in under $100 and has a beautiful classic colorblack pattern that I adore. The shift shape is flattering to nearly anyone and it’s getting stellar reviews. It is shown here with the Keepsake Pouch ($38 to $55 + 20% off) and the Adelaide Kitten Heel Pumps ($150 + 20% off). One of my favorite ways to create an outfit is to play around with tones of the same color, something Boden does very well themselves. This outfit, featuring the British Tweed Pencil Skirt ($130 + 20% off), Bernadette Sweater ($95 + 20% off), Paola Purse ($75 + 20% off) and Jennifer T-Bar Heel Pumps ($180 + 20% off) is a stunner! The sweater also comes in a cute ruffly cardigan version that’s subtle, not overdone. Below are my 10 outfit ideas, which all feature different clothing items but can easily be mixed and matched. At the end of the post find out how to take 20% off your Boden order — today only. Boden excells when it comes to flattering dresses, and my first three outfit ideas all start with a cute dress. Here it’s the Darcey Knitted Dress ($190 + 20% off), a pretty knit colorblocked frock that’s got a perfect review score. The dress is shown with heels online and that works beautifully. In the spirit of Fall for this outfit I’ve paired the Darcey with the Marlow Ankle Boots ($150-$160 + 20% off) in a warm pewter color. Then it’s time to accessorize it with the Toulon Bag ($230-$298 + 20% off), Polly Waist Belt ($45 + 20% off) and the Rosie Necklace ($45 + 20% off). Next up, we have pattern play that begins with the Fall-ready Alda Dress ($110 + 20% off). This dress is crease and wrinkle-resistant, making it ideal for a day of work, sitting and standing, or running around after the kids. I’ve shown the graphite version here but it also comes in a navy print or a solid navy. For some fun I thought it would be cute to pull the pink out of the dress via the Paola Purse ($75 + 20% off), though you could easily go with a solid bag here too. The yellow Jennifer T-Bar Heel Pumps ($180 + 20% off) complement the pink perfectly. Although high heeled, these pumps are very comfortable! I find Boden does a great job of making sturdy heels that are wearable and walkable. Rounding out this look are the Thomasina Necklace ($45 + 20% off) and the Justina Bracelet ($38 + 20% off). Both also come in gold. Everyone loves a good ballet flat, right? The aptly-named Ballerina ($90 + 20% off) comes in a few different color combinations (another one is coming up further down this outfit lineup) and makes any outfit comfy casual with just a touch of dressed up chic. I’ve rounded up some more cute Boden dresses in the shoppable photo boutique at the end of this post! We now head into skirt territory, where Boden is again killing it with their patterns and shapes. I adore a good pencil skirt…and a good pencil skirt has been really hard to find lately! Boden’s Richmond Pencil Skirt ($110 + 20% off) is ultra-flattering, with a nipped in waist that’s perfect for hourglass or pear shapes while creating more curves on straighter-shaped ladies. In addition to 4 new patterns, the skirt is also on sale in two equally pretty patterns. 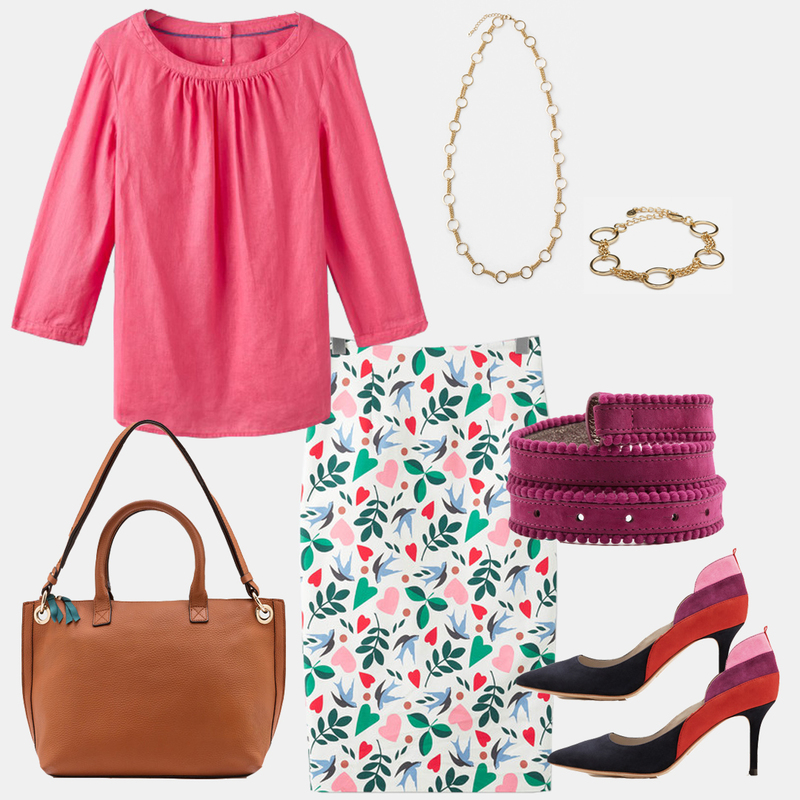 For this easy yet beautiful office outfit idea I pulled out colors from the skirt into each coordinating item, from the pink of the Katie Top ($85 + 20% off) to the tan in the Toulon Bag ($230-$298 + 20% off) and the gold of the Erin Necklace ($45 + 20% off) and the Erin Bracelet ($30 + 20% off). The Polly Waist Belt ($45 + 20% off), which is totally optional, plays with the pinks and greens well. The last piece of this look might be my favorite! It’s the Carrie Mid Heel Pumps ($150-$170 + 20% off), which from the front look simple and navy but from the back hide a delight of stripes! These are my must-have shoes so far for Fall. The yellow Jennifer T-Bar Heel Pumps ($180 + 20% off) from look 2 make another appereance here as does the Lyon Crossbody Bag ($150-$170 + 20% off) from look 3. Here’s another way to play with the red-navy-yellow combination that’s slightly dressier. The Brittany Lace Top ($140 + 20% off) is a necessary addition to my closet with its adorable tie-back and slightly flared sleeves. In this look we have a second pattern of the Richmond Pencil Skirt ($110 + 20% off) seen in look 4 above and the versatile Lyon Crossbody Bag ($150-$170 + 20% off) makes another appearance. For fun, the Skinny Belt ($38-$45 + 20% off) can be worn with these pieces or left off. Rounding out this look are the Albertina Flats ($130 + 20% off) and the Luz Sunglasses ($79 + 20% off). Teal and coral look amazing together so I used them as the basis for this look. The Richmond Pants ($98 + 20% off) are ideal for ladies with a ruler shape or who are smaller on the bottom! They have a very close fit through the thighs and hips which do not make them ideal for me or other curvy shapes. Here they work perfectly with the Jennifer T-Bar Heel Pumps ($180 + 20% off) in coral. To make the rest of the look more neutral I chose the Martha Top ($90 + 20% off), the tan Toulon Bag ($230-$298 + 20% off) and a double-stack of bracelets, the Justina Bracelet ($38 + 20% off) and Erin Bracelet ($30 + 20% off). Now we move into pants, beginning with jeans, which did not fly at my last job (a very conservative office environment) but are a-ok at my current place. It comes as a relief to me, especially since jeans can easily be made dressy! This outfit would also be ideal for being out and about as I love to do. It begins with the Cavendish Girlfriend Jeans ($90 + 20% off) and is paired with the simple yet incredibly flattering Eva Ponte Top ($60 + 20% off). Then for some fun I matched these pieces with the Slipper Shoe ($90-$95 + 20% off), the Classic Belt ($60-$70 + 20% off) and the Lyon Crossbody Bag ($150-$170 + 20% off). Here’s another outfit that could easily do work or play. This look begins with the Brighton Biker Skinny Jeans ($90 + 20% off), my absolute favorite Boden pants that have modern touches and a truly impeccable fit for curves! They come in four colors; I chose classic black for this outfit. They are paired with the trendy and ruffly Rae Ruffle Sleeve Tee ($55 + 20% off), the Rosie Necklace ($45 + 20% off) also seen in look 1, and the exceptionally cute Esmeralda Sneakers ($110-$130 + 20% off). This outfit would be an easy weekend throw-on for me, and would also work for casual Friday at my office. You could dress it up a bit with a blazer for work too. Rounding out this outfits set is a look that can do so many things, from work to brunch to mommy’ing to family get-together to whatever you need it to do! We begin with the Hampshire 7/8 Pants ($90 + 20% off), which are the curve-friendly complement to the Richmond pants in look 7. We saw the Brittany Lace Top ($140 + 20% off) in red in look 6 and now here it is in a creamy ivory white. The Ballerina ($90 + 20% off) from look 3 makes another appearance here, this time in a more subdued navy color. By contrast I couldn’t wait for a look to showcase the Toulon Bag ($230-$298 + 20% off) in leopard, also seen in looks above in solid colors. The topper to this outfit is the Beaded Military Jacket ($140 + 20% off), which could work with any casual outfit and some dresses too. I love the subtle beading down the sleeves! Boden makes it so easy to create outfits with their complementing colors and shapes! I hope you’ve enjoyed these ideas; below is a boutique featuring more of my Boden new arrivals picks. Today only, community members can take 20% off their Boden orders via this affiliate link using the code 9MHB. This post is part of my Work-Ready Shopping Guide Series. See all the posts in the series here. I love the pattern mixing that both you and Boden present! The few pieces I have ordered from them have been great (Bretons and Make a Statement Bretons and Classic Shirt with fun images) and sized predictably. Oh and I love their sock sets: I have London themed set and polka dot themed set. They were gifts which just never quite got wrapped for others….. You showcased their Martha Dress I think and it looked so great but haven't taken the plunge into their print dresses yet. I am going to try the Lois Dress in Chambray for starters. I agree, their bretons are awesome! I have a post in the pipeline about striped shirts because I find them so versatile, especially for layering! Love their socks!!!!! I've worn my set so much they are starting to wear out. I wish they did the palace guard ones again this year because they are just so adorable. Thanks, Roxy for all the cute outfit ideas! So glad you liked them Anthropolitan!! You're welcome, so glad you enjoyed it! Hi! How do you find Boden jeans to fit? I have a hard time finding jeans– I have a larger stomach and calves but less in the hips and rear. Any advice would be appreciated! Or other brands, if you have suggestions. Multipart answer. First you should know that I have large calves myself and often find that jeans — especially skinnies — don't have enough room or stretch for them. I personally think you'd have good luck with Boden's Soho Skinny Jeans, which have more room through the waist (hence the reviews calling them 'baggy' by some, probably people with ruler shapes) or their Trafalgar Straight Leg Jeans, which have a higher rise and some room through the leg. I am usually a 10/30 in jeans and either take that size or a 12/31 in Boden's jeans. Finally, if you have a Madewell by you, I really recommend their denim! It is somehow slimming and super on many different body types. This is my personal favorite pair, but I see they're nearly sold out. Here's that same jean in a different wash. If you live near a Madewell then go in for a try-on of their many denim styles. If you don't, I'd say go for the 9" or 10" high rises in a darker, uniform wash. I'm nearly always a 32 in Madewell denim. Hope this helps! Community, who else do you recommend? Thanks Roxy. This is so helpful! These work outfit posts are so helpful, Roxy! This is slightly OT, but I bought a bunch of items from J Crew Factory during the last work outfit post, AND I'm keeping most of the items! This is a slight miracle because I end up returning almost everything I buy (then again, I buy mostly from Anthro which could be the reason for the high return rate . . .). I do think, though, that I'm just not very good at putting outfits together, and in this sense, your outfit suggestions are very helpful. It's like having a personal stylist! 🙂 I also appreciate that you suggest items of good quality. I bought a dress based on another blogger's recommendation, and it ended up being of poor craftsmanship and an awful synthetic blend. Needless to say, I am returning it–out of my own pocket. ugh! I am beyond delighted that your order worked out wonderfully for you!!! 😄 That is probably the highest compliment that I could get and I truly appreciate it! !